Transportation is crucial to get us from one place to another. By nature, humans are social animals. We thrive in the company of other people and we enjoy exploring outside of our comfort zone. The world is a big space that we can never fully explore unless we take travel seriously. Unfortunately, traveling requires money – lots of it. So unless you have it, there go your travel goals down the drain. Meanwhile, the purpose of transportation is not only to transport people from point A to point B. Transportation is also crucial in transferring goods from various places in and out of the country. Big trucks are usually loaded with various types of goods and produce to deliver supplies and make sure that stores and supermarkets are well-stocked to meet consumer demands. However, a lot of road mishaps are also because of either drunk or sleepy truck drivers who often drive through the night to make their delivery on time before most stores open. Ensuring an orderly transition toward a future of automated, driverless trucks is an impending task for global policymakers, according to a new report released on Wednesday (31/05). “Governments must consider ways to manage the transition to driverless trucks in order to avoid potential social disruption from job losses,” the report said. The report, “Managing the Transition to Driverless Road Freight Transport,” was jointly prepared by the International Transport Forum (ITF), European Automobile Manufacturers’ Association (ACEA), International Road Transport Union (IRU) and the International Transport Workers’ Federation. As rapid technological changes transform all facets of society, the transportation industry in particular is looking at a future of road freight transport that is projected to cut down costs, reduce emissions and make roads safer. “Self-driving trucks already operate in controlled environments like ports or mines. Trials on public roads are under way in many regions, including in the United States and the European Union,” José Viegas, ITF secretary-general, said during the report’s launch in Leipzig, Germany. Additionally, driverless trucks will also address a shortage of professional drivers in the industry. Like with anything that is being automated these days, the government is now considering automating trucks to lower emissions, save money, and reduce the occurrence of road accidents. If there is any drawback to it, it has to do with the job losses that this massive automation will result to. Former US President Barack Obama is speaking out on automation and driverless cars, namely the impact the futuristic tech – that’s closer to reality than it once was – could have on the economy. Obama, writing in The Guardian, discusses a number of issues related to climate change, including food security and the changing workforce. He shares a concern that with technology comes increased automation; it happened in manufacturing, and now it’s taking place across the service and managerial sectors. 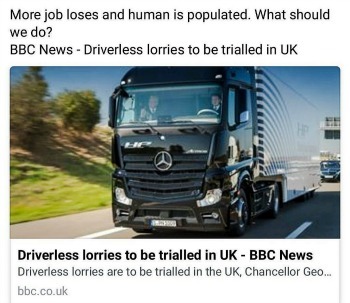 They’re not just thinking of driverless trucks but driverless cars in general. And it is already happening around us with Tesla’s Autopilot and Uber’s self-riding cars when carting passengers. Many other bigger tech and automobile companies are all developing their own version of self-driving cars too as of the moment and it won’t be long enough when these driverless vehicles take to the streets without the law requiring a human operator to drive them. Issues arising from this drastic change in our way of life will largely impact truck drivers or drivers in general for they will lose their jobs when cars no longer need people to drive it in order to run. The government has to look in closely how it will change the lives of the people and that of society, so that no one will be displaced and that alternate work opportunities will be provided to everyone affected. What kind of work does the truck usually do? in what ways can trucks help with community work?